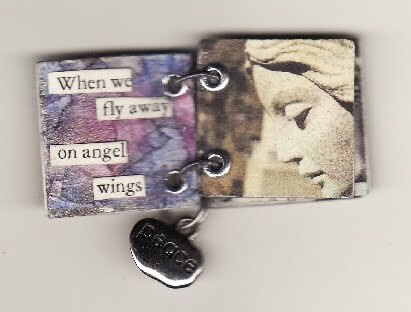 Over at Addicted to Inchies Yahoo Group this month we are making inchie books instead of our usual make themed pick inchies. My partner recently lost her husband who was battling cancer so I found this nice verse to add to my inchie book. 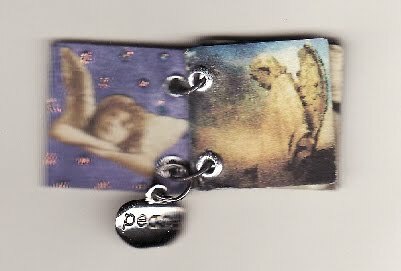 This first pic is the front and back cover and I attached a charm to the bottom ring that says Peace. The first inside page is done with a plain piece of cardstock with ripped pieces of masking tape layered one over top of the other till the cardstock is covered. 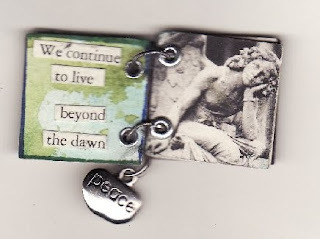 I then took my Twinkling H20's and painted using more than one colour blending one into the other then applied the words. And this page is done using Twinkling H20's on cardstock with orange, purple and looks here like gold. I placed eyelets on all the pages then made my own rings out of wire to hold the book together. I hope JoJo likes it. It was fun and it all came together as I had planned. Don't forget inchies are a one inch x one inch square so if you can imagine a book this small, here it is. I have completed I think 10 or more now, they are very addicting. And these are some Zetti cards I made for a FlickR group I belong to, Let's Swap ATC's. 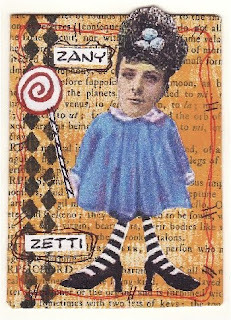 I always thought Zetti was on a dark side of art of which I don't really find appealing to me but it is not, it can be if you chose it to be but basically you can stick heads on bodies that are larger or smaller, different legs and arms. I have played around with backgrounds using old book pages, acrylic paints. I used lids to make circles and markers to do borders. 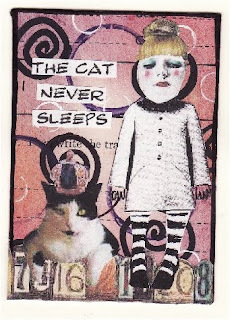 It is a free style sort of Zany art as I like to call it. 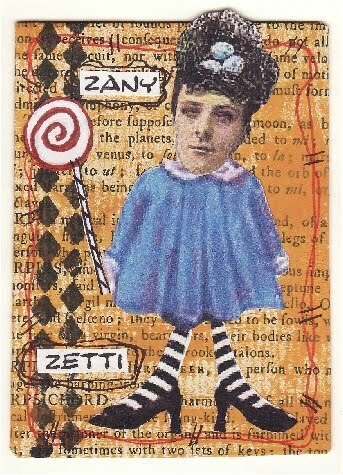 Zany Zetti is still available for my trade group but the 2 below it are spoken for and soon to be travelling to their destinations. So have fun with art, relax and just go for it. Oh Lesley the inches book is just lovely. A very appropriate gift for a grieving friend to hold in her hand at a time like this. I love the verse. What a kind friend you are. Lae love your new summery look blog! I adore the inchies book - so touching and thoughtful. 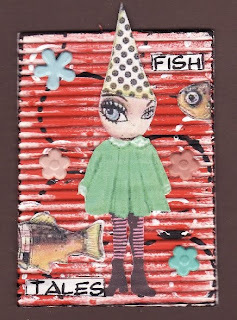 And I love anything zetti - fab cards!! Love the look of your blog! Great artwork! You are so creative! 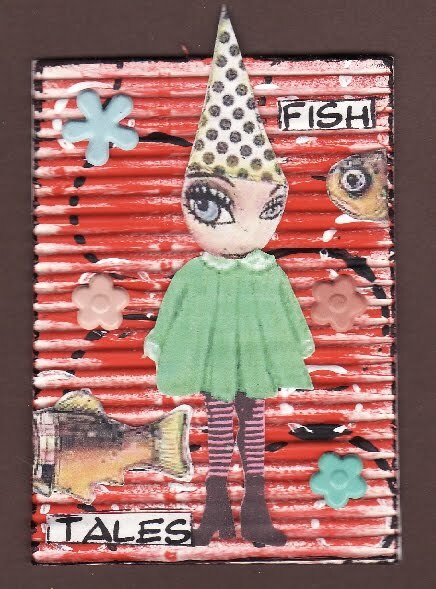 Oh Les, your inchies book is just wonderful...love the background effect with the masking tape too and LOVE your zetti cards - absolutely fabulous!! Love the inchy book. Such a thoughtful gift. 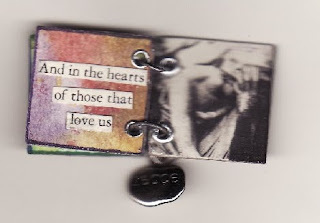 Love your atc's and inchie book Les! Your new blog look is looking pretty and summery too!